The following 7 colors will have black nose, paw pads, eye rims and lip rims. Unless other wise stated. BLACK - Black is a dominant color and is relatively easy to accomplish by breeding a black to any other color, you will most likely have some black offspring. 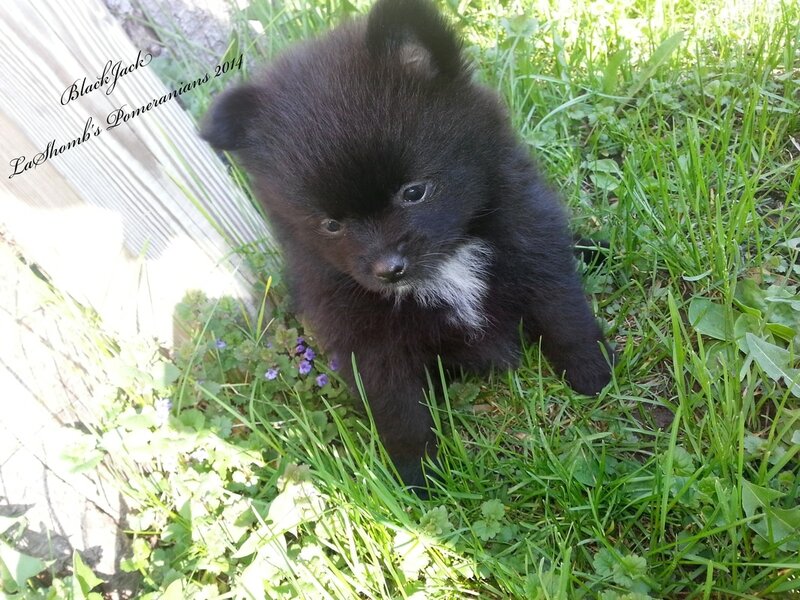 If you breed a black to any other color you will get 50% black pups. You could also breed to a chocolate to get black offspring for example; chocolate bred to red or orange would give you black offspring. Black can also be produced when a “Clear” red or orange is mated to a dog showing sable in the coat. There are many ways to get black. You could breed a blue to an orange (that doesn't carry dilute) and get black; black & tan to orange and get black; chocolate to blue and get black; chocolate to black & tan and get black... so many combinations! Any two colors bred together will produce black, so long as they do not both display the same color factor. For example, blue to chocolate, will give you black, because the blue does not display chocolate (otherwise, it would be a beaver), and the chocolate does not display the blue (dilute). However a chocolate and a chocolate & tan could not produce black, because they both display the chocolate factor which would be a double dose of a recessive gene. BLACK & TAN - Black & tan can be produced by breeding a black & tan or a chocolate & tan however in Poms the gene can easily be covered up by another gene that allows the body to appear solid and then modified by the gene that restricts color to make a black & tan appear to be sable, when genetically it is a black & tan. 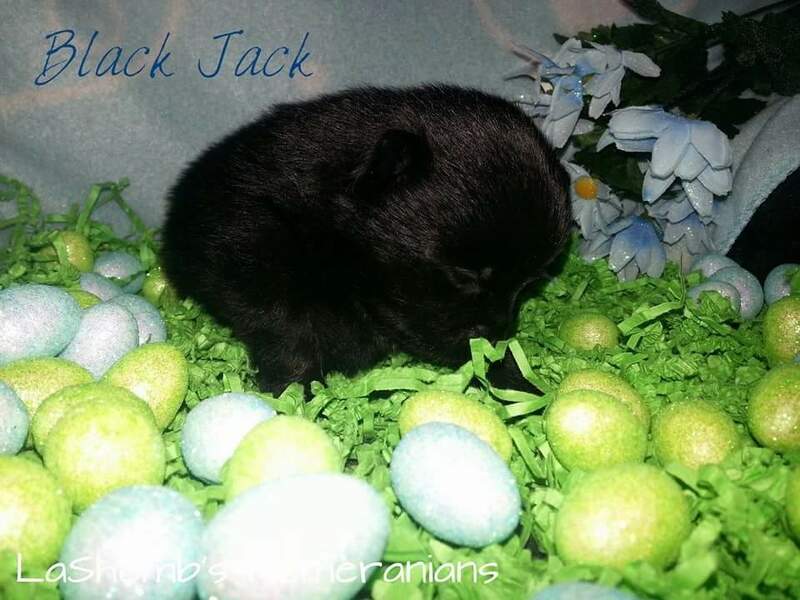 You need black & tan present in a double dose to produce black & tan pups. So both parents must be either black & tan or be carrying the black & tan gene. BLUE - Blue is the dilution gene acting on the color black, not to be confused with blue merle. 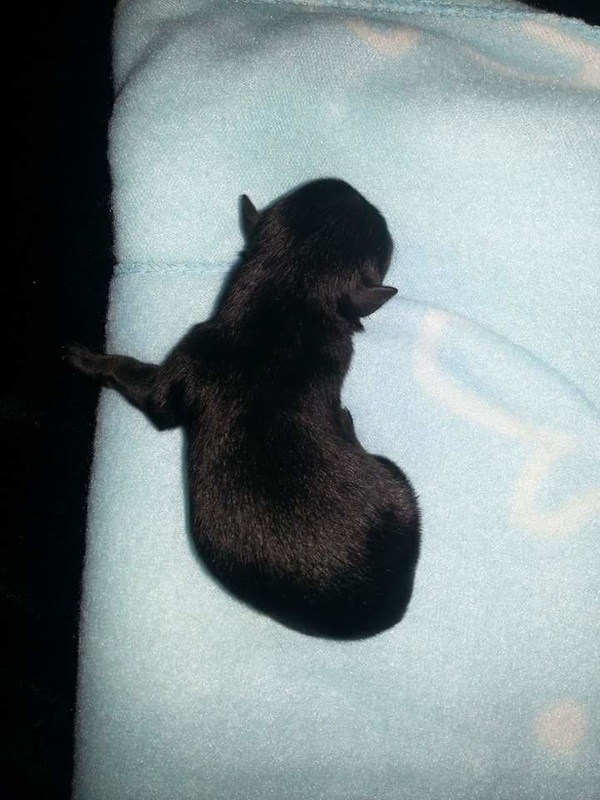 This color can be produced by breeding a blue to a black, if the black carries dilute (has a dilute parent, or if it has a lot of dilute dogs in it's pedigree or siblings of the dilute color, you have a better chance). Also by breeding blue to blue. Another example would be a red sable to a cream, carrying the dilute gene which would be noticeable by diluted pigmentation. Despite the color of the parents the main thing here is BOTH parents must carry a copy of the dilution gene to be able to produce any blue offspring. The eyes are generally lighter than in undiluted (black) litter mates and may be blue at birth darkening as the dog reaches 1 year old. The nose, eye rims, paw pads and lip edges will be dark gray. Some blue dilute individuals may have dark eyes. SABLE (RED OR ORANGE) - When breeding for sable the best way is to breed to a sable. In most cases sable to sable will yield more sable offspring. Sables nearly always have black whiskers. An "orange" dog with black whiskers, is fairly likely a sable. A dog with even just a small patch of black hair is considered a sable, or with occasional black hairs intermixed in the coat is still, genetically, a sable although they appear orange. CLEAR (RED OR ORANGE) - These colors can be produced when bred to each other, these dogs do not have the ability to produce dark pigment in the hair. 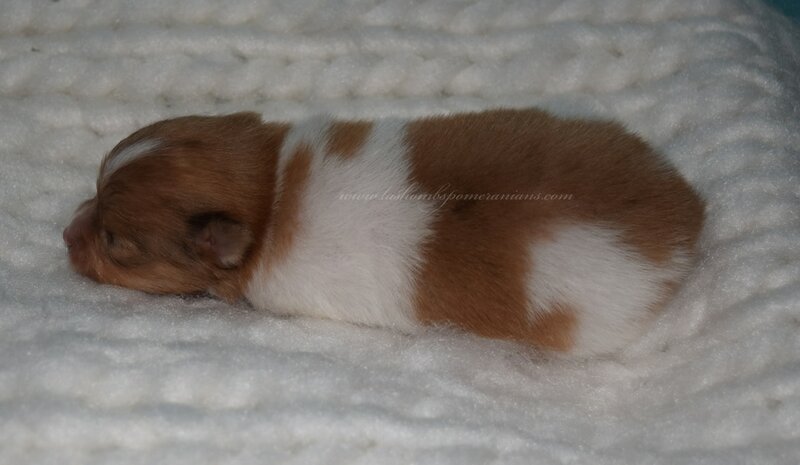 This color can also be accomplished when breeding a clear red or orange to a dog with sable, as long as the sable carries the recessive clear gene. However when clear orange or red is bred to a sable dog black pups can also be produced from this type of mating. The following 3 colors will have chocolate/brown colored nose, paw pads, eye and lip rims. Unless otherwise stated. CHOCOLATE - The easiest way to get chocolate is to breed to a chocolate dog or a chocolate factored dog, for example a black dog that is chocolate factored. Chocolate is recessive to black. If a black from a pedigree with many black to black breedings behind it is mated to a chocolate you will most likely get black pups. However you can increase your chances for the color chocolate if you breed two blacks together and they each had one chocolate parent, you can expect 3 black pups to every 1 chocolate pup so a 3 to 1 ratio for the color chocolate. To further increase your chance for chocolate you can breed a black who comes from one chocolate parent to a chocolate and 50% or 1 in 2 of the pups will be chocolate. Chocolate to chocolate will always yield 100% chocolate puppies but since chocolate is a recessive color they could be carrying a hidden dilution factor and the pups could turn out to be a light chocolate instead of the rich Hershey chocolate color you are most likley striving for. BEAVER - Beaver is produced when breeding chocolate to chocolate and both are carrying the dilute gene. It can also be accomplished by breeding a dilute factored black (a black dog which has the dilute gene such as a blue) to another color that is carrying or displaying both the chocolate and dilute forms. The dilution factor is not easily detected in the chocolate dogs except when the chocolate is not a rich dark chocolate, which may be the dilute gene at work or another series of genes modifying the chocolate gene. In a black dog the dilution factor can be noticeable by a light brown eye color. The color is often compared to that of a Weimaraner. Both parents must carry the dilute gene and the chocolate gene as well. LILAC - Lilac is the same gene in action as above in the beaver dog except it effects the color chocolate more intensely making it a lighter shade of beaver due to other modifying factors; hence lilac or lavender.. This color can be produced by breeding chocolate to chocolate, blue to chocolate, beaver to chocolate. Both parents must carry a copy of the dilution gene to be able to produce any lilac offspring. The more chocolates you have in a pedigree the better changes you will have at producing this color, and it is best if the lilac color can be seen with in the first three generations of the pedigree. You will also want to have blues or beavers in there, the first five generations as well, or you do not have much of a chance in getting lilac. The following 5 colors could have either black or chocolate nose, paw pads, eye and lip rims depending on what "base color" they are (chocolate or black). WHITE - White is a recessive gene and produced when two whites are bred together, or when one parent is white and bred to a white factored dog. White factored dogs may be any color hence masking the color white although it is there and can be pulled out when bred to either a white dog or another white factored dog. A true white, will be a pure snow color, there will not be any shading to the coat, otherwise this places the dog into the cream category. The color will be solid without another hue mixed in. 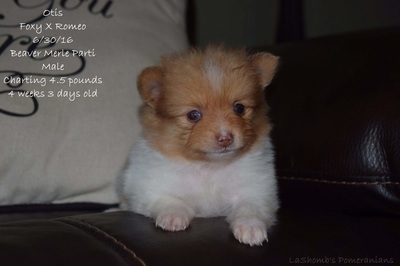 A secondary color will move the Pomeranian to a parti (2 colors). 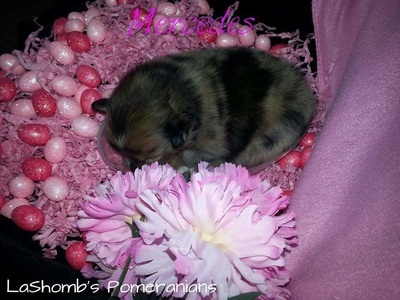 Some parti's are solid at birth and the secondary color will grow in as the Pom matures. For this reason, some Poms are registered as whites, but will mature into parti's. You can have white dogs with black paw pads, nose, etc. however you can also have white dogs with brown paw pads, nose, etc. many people referee to this as white chocolate. 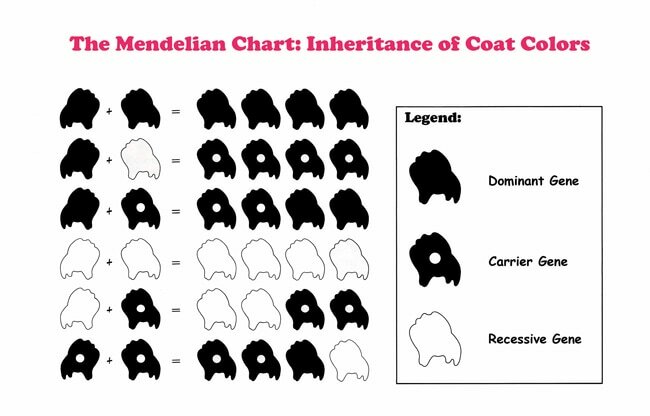 MERLE - This is another dilution gene, but instead of diluting the whole coat it causes patches of dilution. There is no such thing as a sable merle gene, red merle gene or blue merle gene. There is only a merle gene. 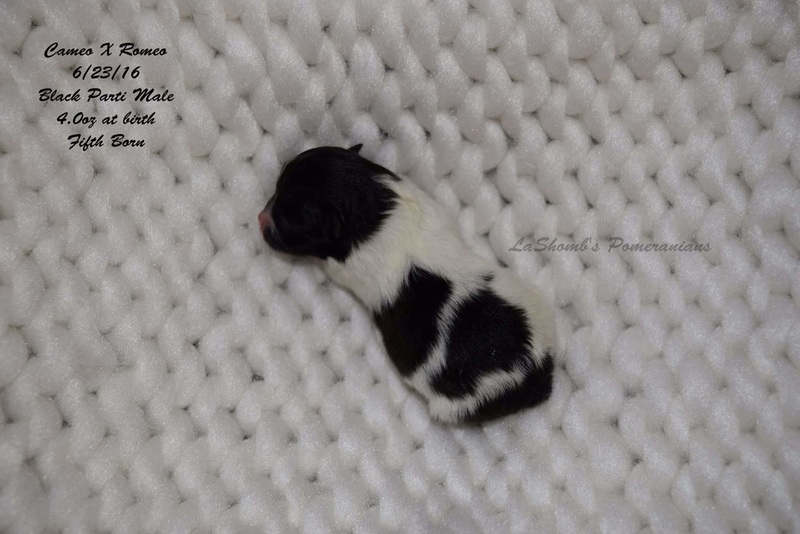 On average over a large number of litters, breeding merle to merle will produce one fourth full colored dogs, one half merles and one fourth defective whites. *(merle to merle breeding is not recommended)* Breeding merle to full color (black, chocolate) will produce one half full color and one half merles, but no defective whites. The merle to full color breeding, then, produces just as many merles as does the merle to merle breeding, and without the danger of defective puppies. The safest breeding for a merle is to a non-merle mate. 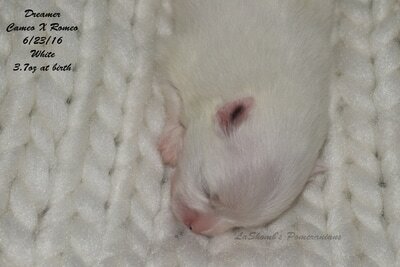 This breeding should produce all healthy puppies, and about half will be merles. Breeders should use caution when breeding merles to sables, as this mating may produce sable merles. Sable merles are not more likely to have health problems than any other color. However sable merles may be mistaken for normal sables. If two such sable merles are mated together, the resulting litter could contain defective whites. NOTE: It is not recommended to breed a merle to another merle, white, piebald, sable or light colors. Merles can have either black or chocolate paw pads, nose, etc depending on their coat color. 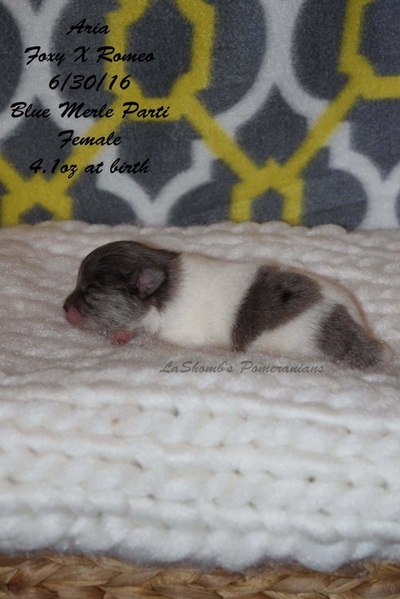 For example blue/black merle will have black nose. True blue merle with have a dark grey/blue nose. Chocolate merle will have a brown nose. 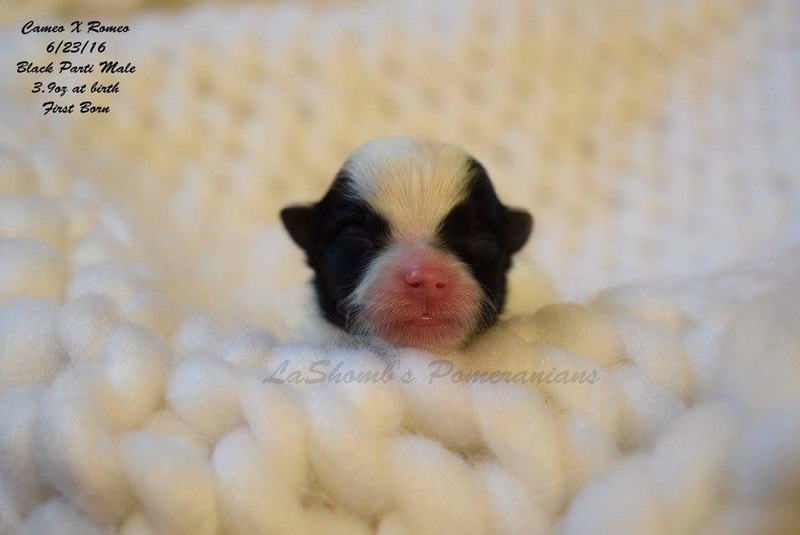 Lilac will have a light brown nose. 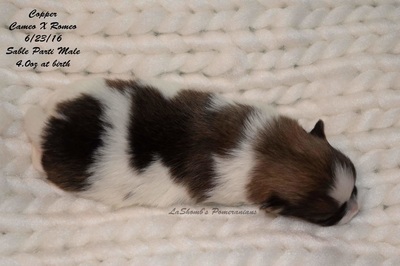 BRINDLE - Brindle in it's self is NOT a coat color rather than a pattern any color dog can have brindle stripes. When a brindle is mated to a non brindle 50% of the offspring will be brindle. In general dominant black suppresses brindle. PARTI - Parti is recessive to the dominant “solid” color, there for must be present from both parents to produce a true parti. Often parti factored dogs; are accomplished by breeding a parti to a solid dog - they are often are solid with a white chest however these mis-marked dogs are capable of producing correctly marked parti pups when they are bred to another parti. The base coat of white with only one secondary color, a white blaze is prefered on the head. EXTREME PIEBALD - White with patches of color on head and base of tail. PIEBALD - White with patches of color on head, body, and base of tail. IRISH PARTI - Color on the head and body with white legs, chest and collar. TAN POINTS: Pomeranians with Tan Points come in three base colors - black, brown and blue. All three base colors share the same tan marking pattern. Pattern: The pattern is sharply defined with Tan points appearing above each eye, on both sides of the muzzle, cheeks, inside of ears, throat, fore chest which has either one very large tan spot or two tan spots called "rosettes" on each side of the chest above the front legs; on all legs and feet, there may be a distinct "pencil mark" line in the base color running lengthwise on the top of each toe on all four feet; the underside of the tail which is on top when the tail is carried over the back; and the pantaloons or skirt. The tan color ranges from a light cream (sometimes referred to as "silver") to a dark mahogany rust. Occasionally there is a lack of the Tan pattern causing some of the markings to be lost or diminished. 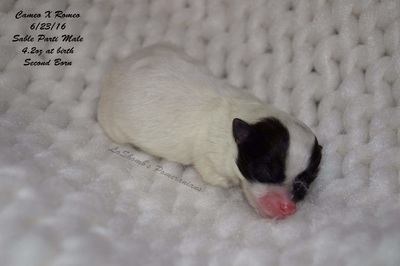 Dogs with any white, other than age graying on the muzzle, with tan markings in areas other than those described here, or without tan markings in the required areas are more correctly referred to as black, brown or blue with tan markings parti color (tri). Chocolate & Tan, include all shades from darkest chocolate to light beaver with tan or rust. They should have brown points (nose, paw pads, etc) , the darkness of the points should be in keeping with the darkness of the base coat color. Blue & Tan poms are blue poms with tan or rust. They should have blue points (nose, paw pads, etc), the darkness of the points should be in keeping with the darkness of the base coat color. AY/AY Dog has two copies of the gene responsible for fawn/sable coat color. n/AY Dog has one copy of the gene responsible for fawn/sable coat color. n/n Dog does not carry the gene responsible for fawn/sable coat color. 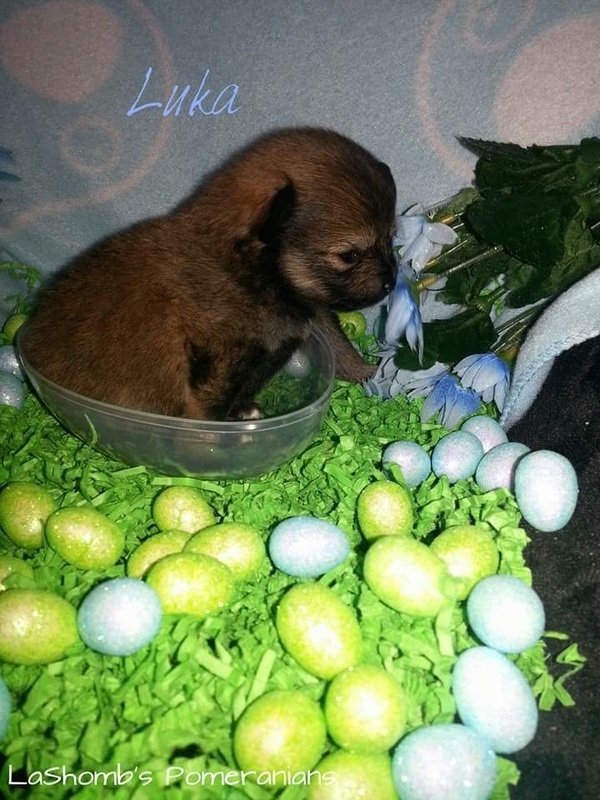 n/AYt Dog has one copy of the gene responsible for fawn/sable coat color. 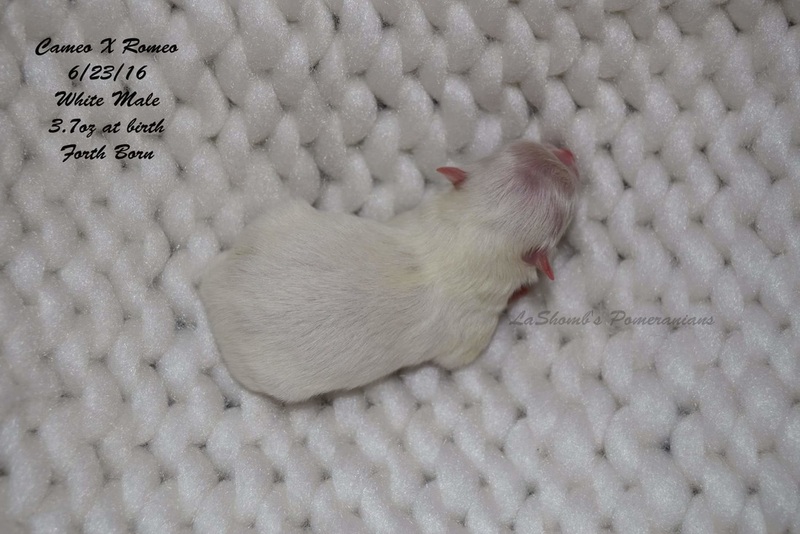 AY/AYt Dog has two copies of the gene responsible for fawn/sable coat color. 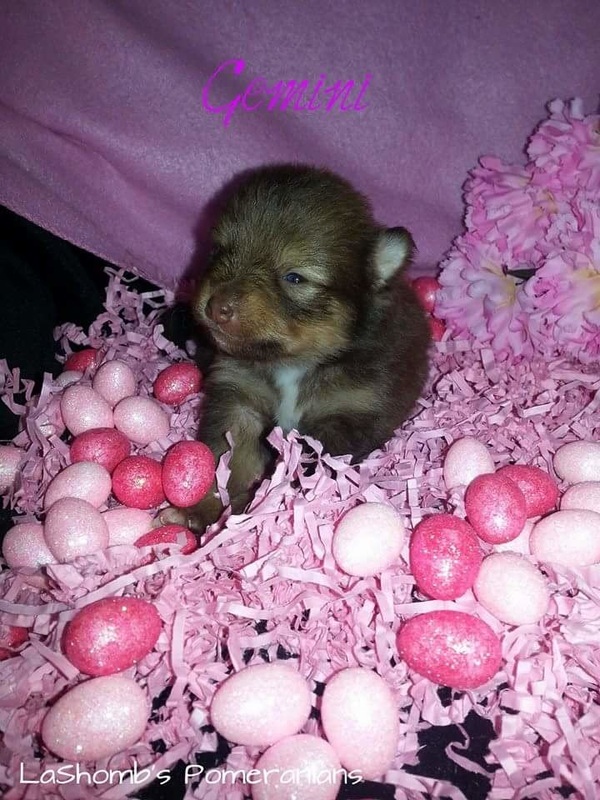 AYt/AYt Dog has two copies of the gene responsible for fawn/sable coat color. 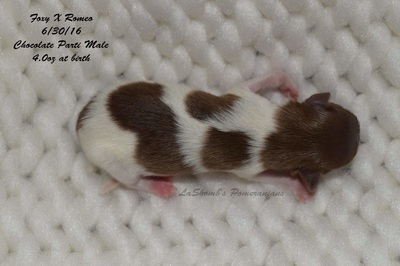 At/At Dog has two copies of the tan points/tricolor gene. n/At Dog has one copy of the tan points/tricolor gene. n/n Dog does not carry the tan points/tricolor gene. a/a Dog has two copies of the gene responsible for recessive black coat color. n/a Dog has one copy of the gene responsible for recessive black coat color. n/n Dog does not carry the gene responsible for recessive black coat color. b/b Dog has two copies of the brown/chocolate gene. All black pigment will be modified to brown/chocolate pigmentation. B/b Dog carries a copy of the allele responsible for brown color, and can potentially pass on that allele to future offspring. d/d Dog is homozygous for the dilution gene. The dog will always pass on a copy of the dilution gene to any offspring. D/D Dog is negative for the dilution gene. D/d Dog carries the dilution gene, but will appear full color. e/e The dog is yellow-based, and will always pass on a copy of the yellow allele to any offspring. E/E Dog does not carry the gene responsible for yellow coat color. This dog will never pass on the allele for yellow coat color. E/e Dog carries the allele responsible for the yellow coat color, and could pass on either allele to any offspring..
E/eW Dog carries one copy of the recessive white allele that restricts production of black pigment. The dog can produce black pigment, but can pass on the mutation to any offspring. e/eW Dog carries one copy of the recessive yellow allele and one copy of the recessive white allele, and can pass either allele on to any offspring. eW/eW Dog carries two copies of the recessive white allele, and will always pass on a copy of this allele to any offspring. n/n Dog does not carry allele for melanistic mask. EM/EM Dog has two copies of allele for melanistic mask. KB/KB Dog has two copies of the dominant black gene, and will be self-colored. Dog will always have self-colored offspring. n/KB Dog has one copy of the dominant black gene. Dog is self-colored, and can pass on that gene to any offspring. n/n Dog does not have the dominant black gene, and the color pattern is determined by the Agouti gene. N/N Negative: Dog is negative for the spotting or parti-color gene. S/S Dog has two copies of the spotting or parti-color gene, and will always pass on one copy to all offspring. N/S Dog carries one copy of the spotting or parti-color gene, and can pass it on to any offspring. M/m Merle Dog has one copy of the "M" Merle allele and one negative "m" copy of Merle allele. The dog can pass either allele on to any offspring. m/m Negative Dog has two copies of the recessive "m" allele and is negative for Merle. The dog will always pass on a negative copy of the Merle allele to all offspring. m/CR Merle Dog has one copy of the Cryptic "CR" allele and one negative "m" copy of Merle allele. The dog can pass either allele on to any offspring. m/m Negative Dog is negative for Cryptic "C" allele. The dog will always pass on a negative copy of the Merle allele to all offspring.